Are you ready for a 3D online casino experience? Sterling Silver 3D is a 5-reel, 25-payline video slot that offers one of the most unique slot features around. The slot, as the name suggests, can be viewed in 3D (with a 3D on/off switch to ensure players can enjoy the slot with or without 3D glasses). When you hit a win combination the visual effects are really something that you will remember for a long time. While the sounds are very pleasant, they are exceptionally entertaining while you spin the reels. A Wild symbol that will substitute for any other symbol (besides the Scatter symbol) to compete winning combinations. In addition, the Wild symbol will stack on the centre reel. The appearance of 3 silver coin Scatter symbols on reels 2, 3 and 4 will trigger a 10x your bet multiplier and activate 15 Free Spins with double winnings. And, players can also retrigger the free spins on Sterling Silver 3D! During a Free Spins session Multipliers will randomly appear with between a 2x and a 10x multiplier supercharging a player’s winning potential. After any win, players have the option to gamble their winnings. With these features players need to guess the correct colour and kind of a card and could. Lose, double or even quadruple your winnings in few seconds! In addition to the simple mechanical-themed graphics, Sterling Silver 3D also offers an impressive 150,000-coin major jackpot. 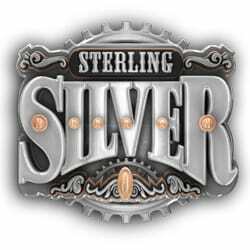 The Sterling Silver online slot is available to play in most Microgaming-driven casinos. We have tested at least 5 different brands and it works very well in every place. To play the game you don’t need to download any software. You can launch the slot via any internet browser using the Flash version. If you want to get exclusive welcome bonus, some free spins or even free chips to play the game, visit our Free Spins List. Our overall rating for Sterling Silver 3D is 8/10.